OC South & East Midlands Wing, Wing Commander Pass visited the 1360 (Stapleford & Sandiacre) Squadron on Monday 11th for two reasons. 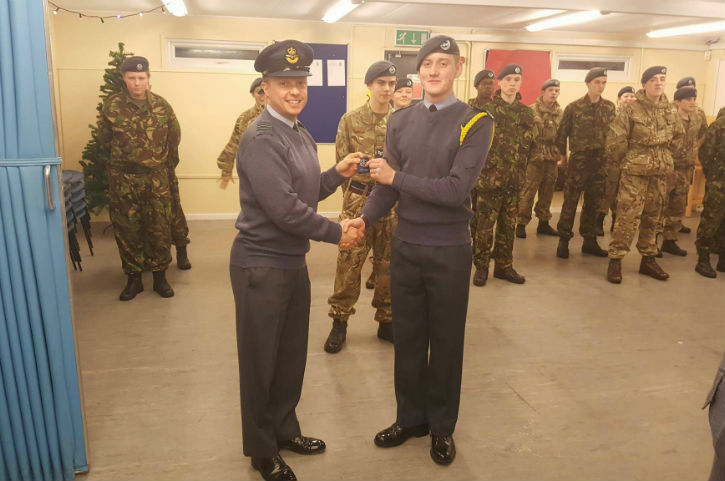 Firstly, to award FS (RAFAC) Theyers his Cadet Forces Medal for 12 continuous years of uniformed service, which he has spent at 2195 (Long Eaton) Squadron and with 1360 (Stapleford & Sandiacre) Squadron This is a fantastic sign of recognition for FS Theyers and a great way to thank him for all his hard work and commitment to the organisation! Secondly, Wing Commander Pass conducted a Cadet Warrant Officer interview. A rank which is the pinnacle of the Air Cadet career, with only 1% of Air Cadets to reaching the rank. A huge congratulations to CWO Matthew Osbiston who passed the interview and was presented with the promotion immediately! Senior Boys Storm To Rugby 7’s Victory! South and East Midlands Wing are the Central and East Regional Rugby 7’s Champions. 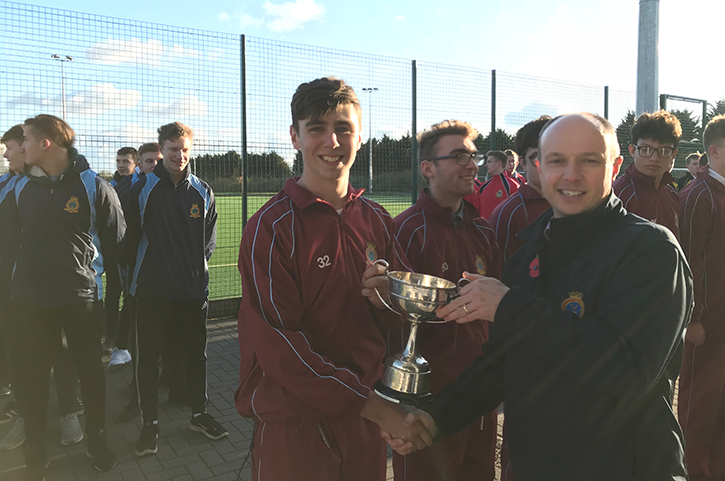 Sunday 5th November saw the Inter Wing competition held at RAF Wyton, where the Senior Boys team, Captained by FSgt Luke Flynn of 2229 Loughborough Sqn and Managed by ATC FSgt James Marman were unbeaten in their run at the trophy, which has never been won by South and East Midlands Wing before. Also held on the same day was the Inter Wing Senior Girls Netball Competition, from which the South and East Midlands Team returned with Bronze Medals. An Air Cadet Squadron from the East Midlands has been crowned the best in the Country and has been awarded the Freedom of the District of South Derbyshire and has said farewell to their Squadron Commander after 33 years in Command, all within the space of a week. 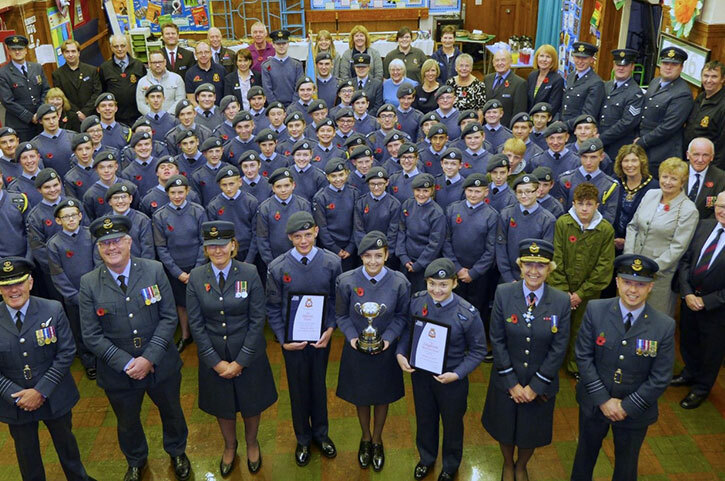 The historic week for 1211 (Swadlincote) Squadron started with a presentation evening where Air Commodore Dawn McCafferty CBE, Commandant of the Royal Air Force Air Cadets (RAFAC) presented the Morris Trophy to the 1211 Squadron, thereby officially recognising them as the best large Squadron in the UK. 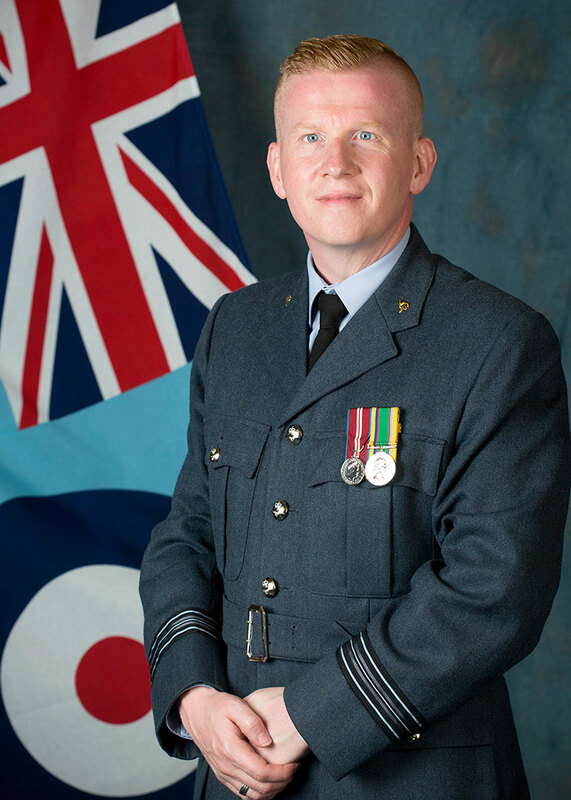 Every year, there is a special award for the SNCO, WO or CI that goes “above and beyond” and this year, Warrant Officer Alan Wiggs of 378 (Mannock) Squadron was the deserving recipient. WO Dominic Chisholm, Wing Warrant Officer of South and East Midlands Wing, presented the award to WO Wiggs on Monday (06/11/17) at his unit in front of all the cadets and staff. However, this award is usually present at the SNCO, WO and CI’s annual Dinning in Night held at RAF Cranwell. 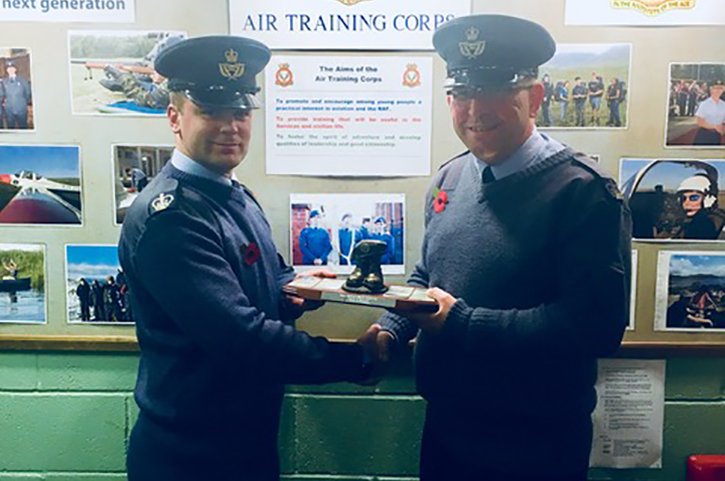 The Wing Warrant Officer had to award it to Alan at the unit as he sadly missed the dinner this year and this makes part of the reason why he has received the award (not out of sympathy we assure you!). A youth organisation named the finest in the country has been granted the Freedom of South Derbyshire. 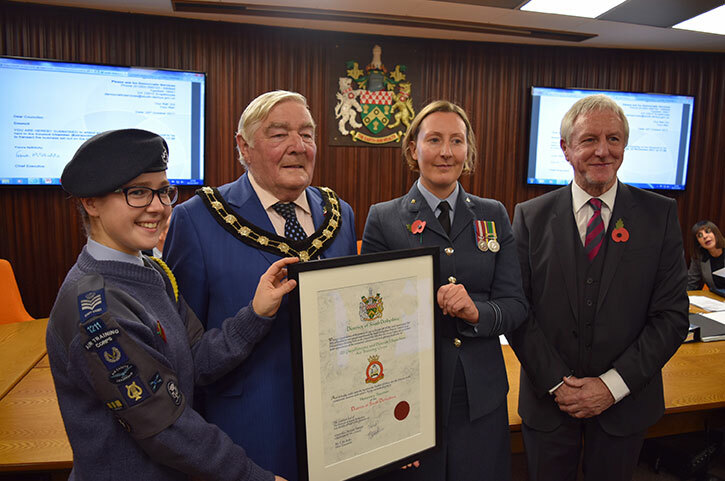 The 1211 (Swadlincote) Squadron Air Training Corps (ATC) received the highest honour the District Council can bestow on Thursday. It means the cadets have freedom of entry into the District on ‘all ceremonial occasions with colours flying and bands playing’. The title of Honorary Freeman is recognition of the work done to help future generations to prosper, as well as the tireless work carried out in local communities. On Sunday 29th October 2017, 7 Squadrons from South & East Midlands Wing ‘Sector 2’ held a Training Day in Derby, to share knowledge and skills for the benefit of the Cadets. 115 Air Cadets and Staff from Melton Mowbray (1279), Loughborough (2229), Long Eaton (2195), Ilkeston (348), Swadlincote (1211) and Coalville (1188) travelled to the new 126 (City of Derby) Squadron Headquarters to take part in the Training Day. 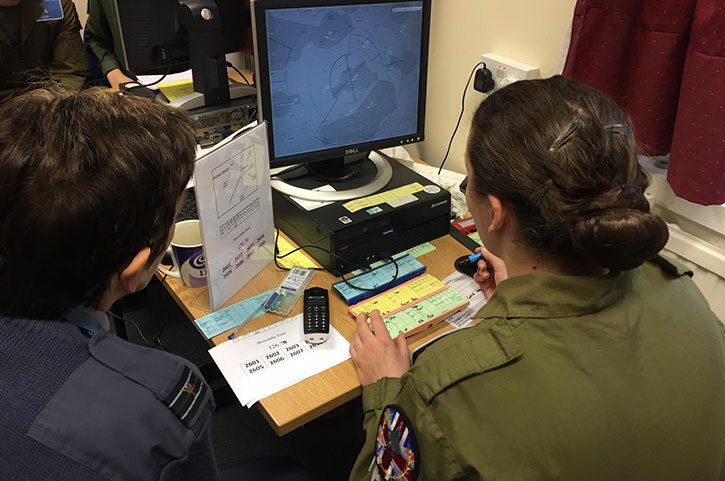 The Cadets took part in activities including Drill, Radio, Air Recce, Aeromodelling, Leadership, Music and BTEC (in Teamwork and Personal Development). First Aid Training was also provided for Squadron Staff. 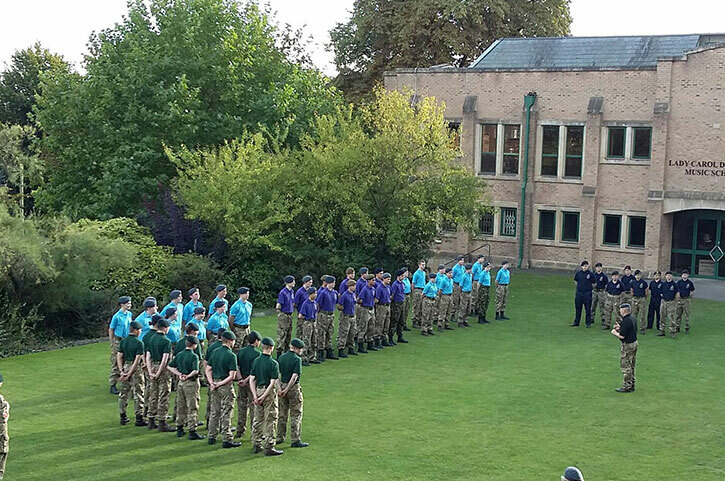 The Nottingham High School played host to Nottingham’s third Inter Cadet Service Competition on Saturday 16th September. 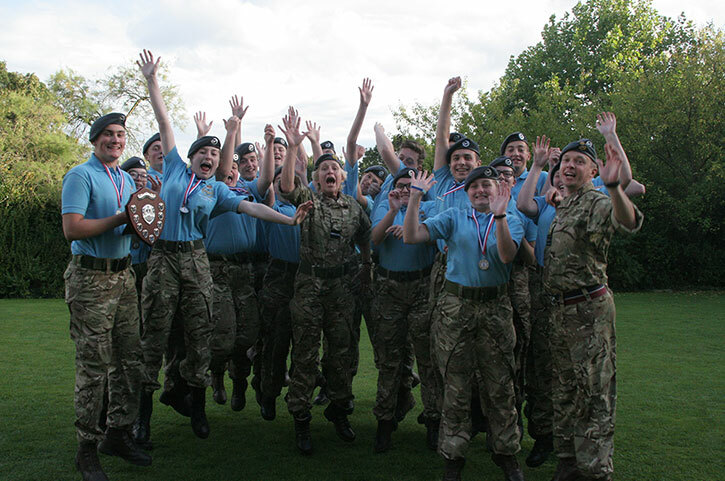 Nottingham units of the Sea Cadet Corps, Army Cadet Force, Royal Air Force Air Cadets and members of the High School’s Combined Cadet Force competed to become Nottingham’s best Cadet Service in the Cadet 17 Competition. The cadets, aged 15 to 18 years of age, completed in eight activities, Air Rifle Target Shooting, A “Gun Run”, a First Aid exercise, Foot Drill,a vehicle pull, climbing wall, and “Battle PT”. Saturday saw cadets proudly participating in the Royal Air Force Association Wings Appeal by helping to raising money in Beeston Town Centre. 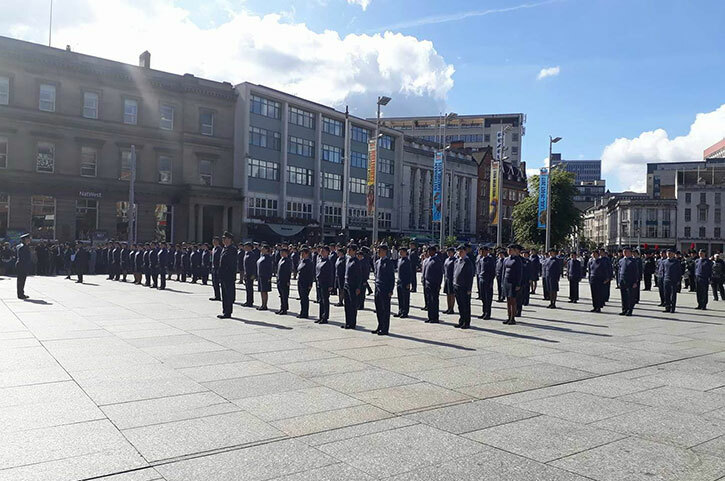 Sunday 17 September 2017 saw 120 cadets from the Nottingham Squadrons of the Air Training Corps attend St Mary’s Church on High Pavement Nottingham as they have annually over the past 77 years in order to pay respect to those airmen of the RAF who fought in the 1940 Battle of Britain. 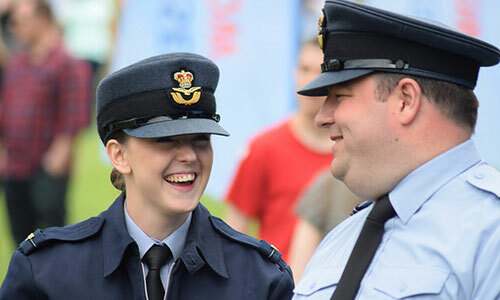 I’m delighted to announce that under the construct of the RAF Air Cadets Development Trust, South & East Midlands Wing have been selected to pilot a new and exciting initiative in signposting Air Cadets to possible apprenticeship opportunities within our local area and across a wide range of industries. 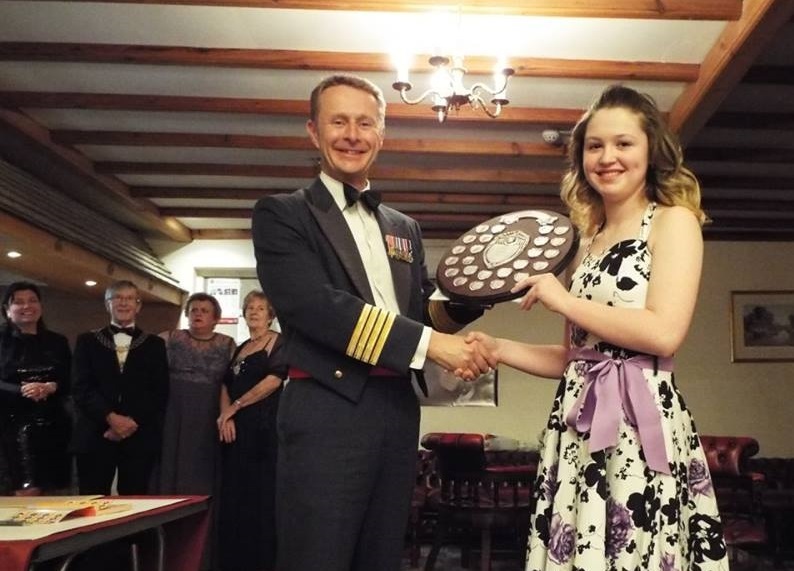 Recently, cadets from 2418 (Sherwood) Squadron offered their service, to the Wigman Road Army Reserve Centre for their annual sports presentation dinner. The cadets through the evening waited on the guests, serving the 3 courses they were having that evening. 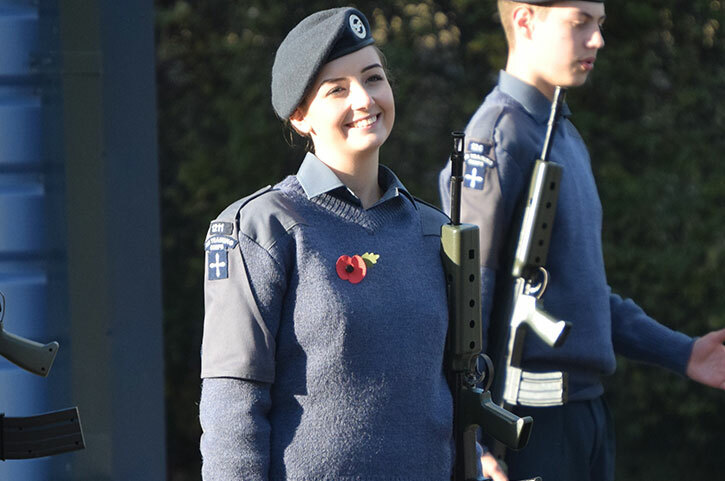 The sweltering weekend of the 17th and 18th June saw 1359(Beeston) Squadron’s Cadet Warrant Officer Jade Cox on duty at Caunton Manor in Nottinghamshire in her role as the Lord Lieutenants Cadet. CWO Cox was appointed to the prestigious position of Lord Lieutenants Cadet in September 2016 and is charged with representing the Royal Air Force Cadets in the County of Nottinghamshire as the Lord Lieutenants personal cadet. This involves accompanying the Lord Lieutenant, Sir John Peace at events he attends on behalf of Her Majesty The Queen. Staff from throughout the South and East Midlands Wing have attended the Prospective Uniform Course which was held at RAF Wittering over the weekend 10 – 11 June as part of their ongoing career development. 22 Civilian Instructors took part in the Staff Development Team course which serves as an introduction to the ATC or to assist in the decision making process for candidates who are at the point of choosing a career as a Commissioned Officer or Senior Non Commissioned Officer within the Cadet Forces.